Earlier this month, I wrote a post about “Never Say Never.” Shortly thereafter, one of those things I swore I would never do, happened. 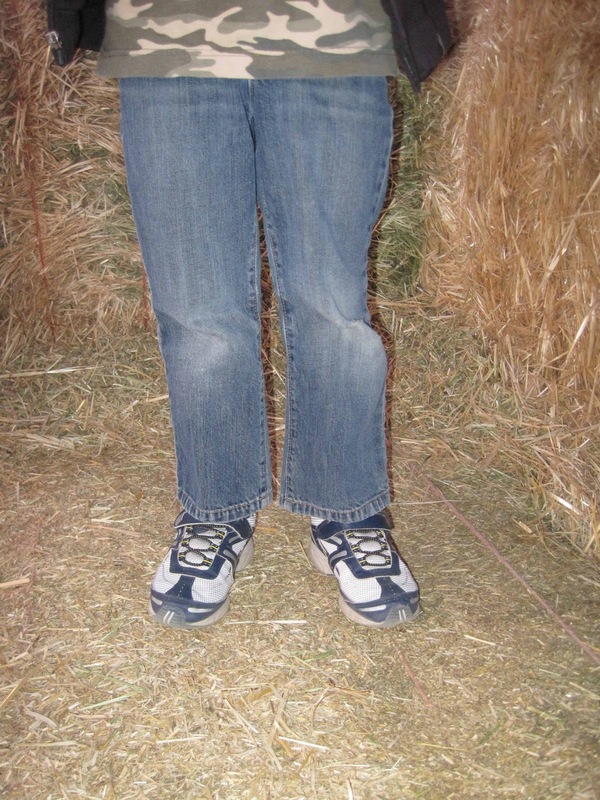 We were heading to a nearby farm for some fun in a corn maze and playing on straw forts and such. The whole fall thing. The days were warm and Brayden had been wearing shorts. I told him to go change into some pants so he would be warm when the sun went down. I rushed around getting everything else ready, then we left. As we were playing, I noticed something. Brayden’s pants! Oh no! You know when you see those kids whose pants are painfully, obviously, too short? Yes, I had said I would never take my child out into public like that. And guess what. I did it. Previous Post Poll Results: AT WHAT AGE DID YOU START YOUR CHILD IN ROOMTIME? This made me laugh because I have said the same thing! That's one of my pet peeves, right up there with babies without pants. You wouldn't believe how many people I see walking around with their kids (birth-3 years old sometimes) with no pants, socks, or shoes here, just a saggy disposable diaper, eww! lol! But yeah, we all have those moments. I know what you mean about trying to keep up with the outgrown clothes, it's hard! Ha!!!! That is too funny! My girl is very skinny and tiny, but she has long legs. So many times, the pants will fit around the waist, but not be long enough. So they are like capris! Which works for Florida! I am not sure what we are going to do in January…guess I will have to get her a belt and start sizing up! I hate that! You have the kid all dressed with his shoes on and you're running out the door, and just as you're leaving, you realize you dressed your kid in floods!! It happens all too often at my house as I sometimes confuse my boys' jeans since they are so close in sizes. You make me laugh! Val, I don't think this is what Never Say Never means 😉 I think it means like when you say my kid will never be the one standing straight up in the cart portion of the shopping cart screaming louder than you though a human child could scream while I'm paying for my groceries. You have a looooong way to go to get there. Still love this post. You're awesome. Amy…"in January"…that makes me a bit jealous. I am like "October-April" lol! In a not so funny way. pwebbie, I know, they rarely fit just right huh.